Niğde Province (Turkish: Niğde ili) is a province in the southern part of Central Anatolia, Turkey. 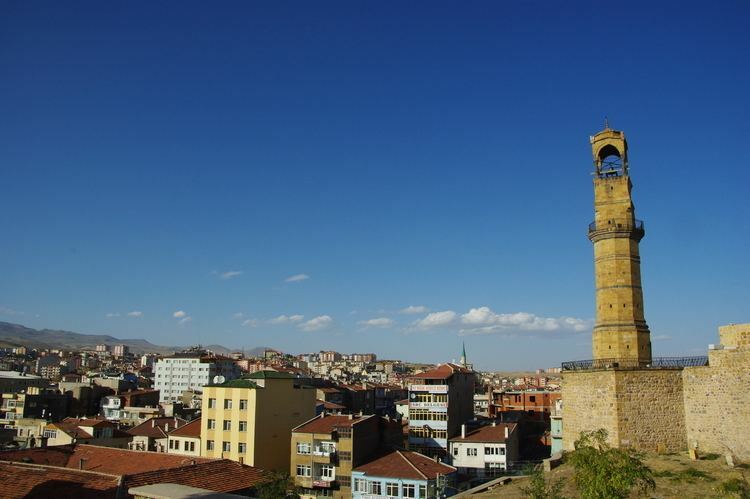 Population is 341,412 (2013 est) of which 141,360 live in the city of Niğde. The population was 348,081 in 2000 and 305,861 in 1990. It covers an area of 7,312 km². Neighbouring provinces are Kayseri, Adana, Mersin, Konya, Aksaray and Nevşehir. The province is surrounded on three sides by ranges of the Taurus Mountains, including Mount Hasan and the Melendiz mountains. To the west lies the plain of Emen, which opens up into the wide plain of Konya. The plain is covered with nutritious volcanic soil and Niğde is a successful agricultural region, particularly apples and potatoes. Surrounded by mountains and at a fairly high altitude the area has a dry and chilly climate and is exposed to snows brought by cold north winds in winter. Average rainfall 0.9 mm, 78.5 mm in April, practically zero in July and August. Therefore, the hillsides are more or less bare of vegetation, with some forest at the higher altitudes. (see Niğde for more information about the provincial capital city). Some of the towns within these districts are Bademdere, Bahçeli, Çiftehan, Darboğaz, Fertek and Kemerhisar. Known in antiquity as Nakita or Nahita the named has mutated through Nekidâ, Nekide and Nikde to today's Niğde. The area has been settled since the Neolithic period of 8000-5500 BC, as proved excavations of burial mounds höyük in the district of Bor, and tin mines on the district of Çamardı -Keste. The area was later settled by the Hittites, who lived here for a thousand years up until 800BC. The name Nig˘de first occurs in written sources in the form na-hi-ti-ia in a Luwian inscription of king Saruanis from Andaval as was pointed out by Ignace Gelb (Hittite Hieroglyphs II  pp. 17–18). Then came Assyrians and Phrygians, Greeks, Armenians, Persians, Alexander the Great, Romans, who built the city of Tyana with its palaces and waterworks. Roman rule persisted from the Eastern capital of Byzantium until the area was occupied by the Seljuk Turks from 1166 onwards. By the early 13th century Niğde was one of the largest cities in Anatolia and a number of impressive mosques and tombs date from this period. The area was brought within the Ottoman Empire in 1471 and thus passed into the territory of the Turkish Republic in the 1920s. Niğde benefits from its rich agriculture, its apples are particlularly famous, and its location between the wealthy regions of Konya and Adana on the Mediterranean coast. Also because the province is near the tourist attractions of Cappadoccia it is close to the airports of Kayseri and Nevşehir. As well as apples important crops include potatoes, cabbages, grain and sugar beet. Niğde is Turkey's biggest potato growing region and has the most apple trees (although newer plantings in other provinces are achieving greater production). Meat and dairy are also important activities along with beekeeping and more recently trout farms. Niğde has a rich tradition of folk culture including song and dance and the famous proverb (the Turkish equivalent of "the early bird catches the worm") - "Bor's eastern market is over, ride your donkey to Niğde". Another Niğde tradition is to plum someone (Erikletmek) meaning if you have visitors sit them in the garden and fill them up with plums (or other fruit) so you don't have to give them dinner. The Aladağlar and Bolkar mountain ranges in the Taurus mountains are popular for winter sports, climbing and trekking through the high meadows and mountain villages. The mountains are particularly attractive when the hills are covered in spring flowers. The Aladaglar mountains in particular are one of the most popular climbing venues in Turkey. Although the Aladaglar mountains border on their namesake Aladağ District, in Adana Province, they are generally reached from the villages of Demirkazık and Çukurbağ in Çamardı. The Bolkar mountains have a 7 km ski-run and a crater lake. Niğde is part of Cappadoccia and does attract some tourists to its historical sites, although nothing like as many as the centre of the area in Nevşehir. Sites of historical importance in Niğde include a large number of churches, mosques and underground cities (safe-havens cut deep down into the soft volcanic rock). Another important site is the ancient city of Tyana and a number of Roman waterways in the district of Bor. An important underground city and ancient monastery is located in Gümüşler, Niğde, called Gümüşler Monastery. In Ulukışla, Öküz Mehmet Pasha Complex, a külliye is a 17th century structure. Niğde also has a number of mineral hot-springs and other attractions, so with a little investment in hotels and other infrastructure the province could attract more tourists than at present.